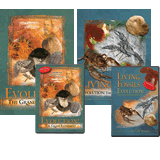 Don’t get fooled with the evolutionists, the menace of giant salt lakes, “fuzzy” math, and more! To mark April Fools’ Day, National Geographic News summarized some historic—and noteworthy, from our perspective—scientific hoaxes. Yet another explanation for a catastrophic mass extinction—could it be? Even for uniformitarians, the geologic record is filled with evidence of catastrophe. Whereas creationists see most of the fossil record as evidence of one great worldwide catastrophe (viz., the Flood of Noah’s day), old-earthers find several major “extinction events” and many more minor ones, each blamed on various hypothetical culprits. We had to check to make sure it wasn’t an April Fools’ prank, but yes, it seems baby birds can do simple math! Astrobiologists may be a step closer to identifying prebiotic compounds in space. Now all they have to do is find the compounds! If you’re living in Europe, you’ve been asked to help find evidence for evolution in your backyard. Several readers wrote to notify us of the LiveScience report Big Blobs Change View of Evolution, syndicated by Yahoo! News. For some reason, LiveScience (and Yahoo!) are a bit late, since the news actually broke last November (see “Living Fossil Found In Grape-Sized Cell”). When it comes to animal intelligence (see “Chicks Can Do Math”), a sea turtle apparently swam to the world’s only licensed veterinary hospital that treats only sea turtles. Of course, it’s possible this was just a random success (the turtle had a bacterial infection, which may be common)—or that the entire story is an April Fools’ Day prank (though the story was originally posted on March 30, according to the website). A cartoonist we’ve never heard of is releasing an “interpretation” of the book of Genesis designed to “provoke the religious right,” according to his publisher. Don’t expect to find the supposed satire in our Answers Bookstore! “Hundreds of Natural-selection Studies Could Be Wrong” reports ScienceDaily on a study by U.S. and Japanese scientists. The study revealed statistical deficiencies in a number of papers on human evolution. “Of course, we would never say that natural selection is not happening, but we are saying that these statistical methods can lead scientists to make erroneous inferences,” the team leader explained. There could have once been life on Mars, blah blah blah, reports BBC News. The “news” is yet another variation on a long-since exhausted theme, and we are getting exhausted continually recapping the scant-evidence-but-lots-of-speculation stories on the possibility of Martian life. In what has the makings of a good April Fools’ story (but apparently isn’t), Reuters reports on an incredibly deep-thinking robot that can “reason, formulate theories, and discover scientific knowledge.” Engineers dubbed it (the first of its kind) “Adam” and are planning a follow-up to be named “Eve”! The supreme court of the U.S. state of Iowa has overturned a 1998 state law limiting marriage to between one man and one woman. The court cited the U.S. Constitution’s “equal protection” clause, although the court’s action actually attacks the definition of marriage as between one man and one woman. Finally, proof that design and “evolution” do go together (sort of)!